A fun crochet coaster pattern! 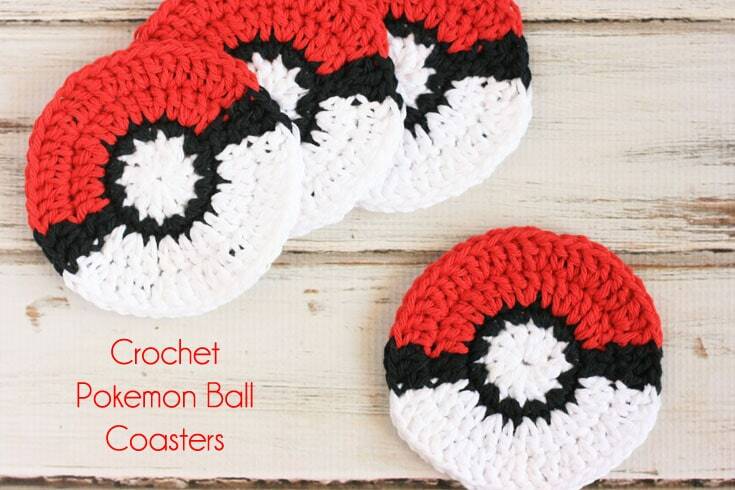 These crochet Pokemon Ball Coasters are perfect for the Pokemon fan! I finally gave in to the Pokemon Go craze. I started to play the game this week. It is kinda fun, but does cut into the crocheting time. HA! 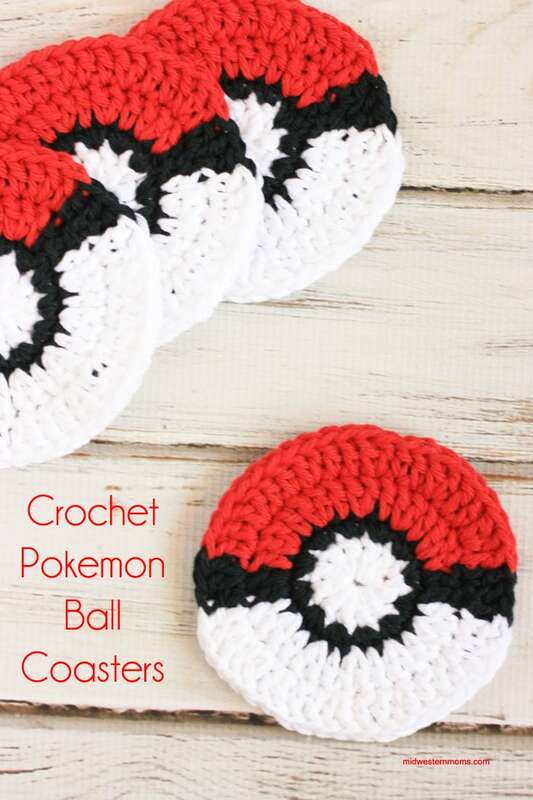 However, I did find time to whip up these Pokemon Ball Coasters. I seriously thought it would be an easy pattern to figure out, but it did take me a day to figure it out. I did make this a learning experience. I had never done a chainless starting stitch. I just was not happy how the chain were looking when I made these coasters so I figure out how to cut them out. I also never cut the black yarn until the very end. I simply just crocheted over it as I went. For a visual on the how to make this coaster, feel free to watch this video. It starts with Round 2. Love these coasters? Make sure you check out the Pokeball Headband pattern! Round 1: White Yarn – Starting with the Magic Circle, crochet a chainless double crochet and crochet 11 more double crochets. (12 stitches total) Tighten you magic circle and join with the invisible join. Round 2: Black Yarn – Join the black yarn and use a chainless single crochet for the first stitch. Single crochet around placing 2 single crochets into each stitch. (24 total stitches) Slip stitch into the top of the first single crochet. Cut your yarn and weave in all your ends. Simply put your email in the newsletter box below and an email will be sent to you with a link to print the pattern. How do I get pokemon coaster pattern?? It is written above. I don’t have a printable file. Sorry. I love the Pokemon coaster made a few very easy. Fun! I’m not a very proficient crocheter, but I think I could handle this and know they would make my husband super happy! He’s been an enthusiastic….what are they called? Trainer? For years. I was trying to find what your policy is on making your items, is it just for personal use? Or are we able to give credit if making items to sell? Hello Alicia. You can make the items and sell them. Credit would be awesome. Just please don’t sell the pattern. Thank you for asking! Thank you! I am making these for all my Pokémon go friends! I love them! I make them coaster holders as well. Thank you so much. Please try the link again. I think there is an issue with my newsletter. However, when people try, eventually they are able to get the link to work. I am looking into new places for email delivery.